Catholic Icing: Catholic Icing is a Finalist! Please Vote! Catholic Icing is a Finalist! Please Vote! I am soooo excited! 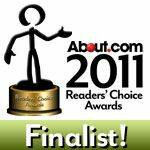 Catholic Icing is a finalist for best Catholic blog on About.com's reader's choice awards!!! Vote for Catholic Icing here! If any of you are willing to click over and vote for Catholic Icing, it sure would be the icing on my cake! You don't have to register or anything, it only takes a minute. There are only 5 blogs that made it into the finals!!! Thanks so much to everyone who nominated me, and for all of my amazing readers! You guys make writing this blog so fulfilling for me! That is so coool! Congratulations!! It just goes to show how valuable your blog really is. I'm glad that you are getting the recognition you deserve. p.s. that cupcake on the award is perfect! I would love to vote for you! Something that is worth noting, you can vote once a day. Lacy, you provide so many wonderful resource. Thank you! So, come on everyone vote for Catholic Icing (everyday!!!). Oh my, you are in the finals with Fr. Z's blog. Wow! That is so cool. Made a huge dilemna for me. But how could I NOT vote for Lacy. I love your site and use it often. i didn't know you could vote more than once. i voted for you yesterday. on my way there now again! you go girl! wow Lacy, you're in second place, just behind Father Z. come on people, vote for Lacy's awesome blog. I've been voting ut it looks like Father Z got a coup together! lol You are steadily in second place but it's not over yet! Congrats and good luck! Your blog is AWESOME!! Just put in my vote, you are in second but it is not over yet. It is awesome to be in the top 5!!!!!! Love your blog!! Congratulations, Lacy! Hoping you win!